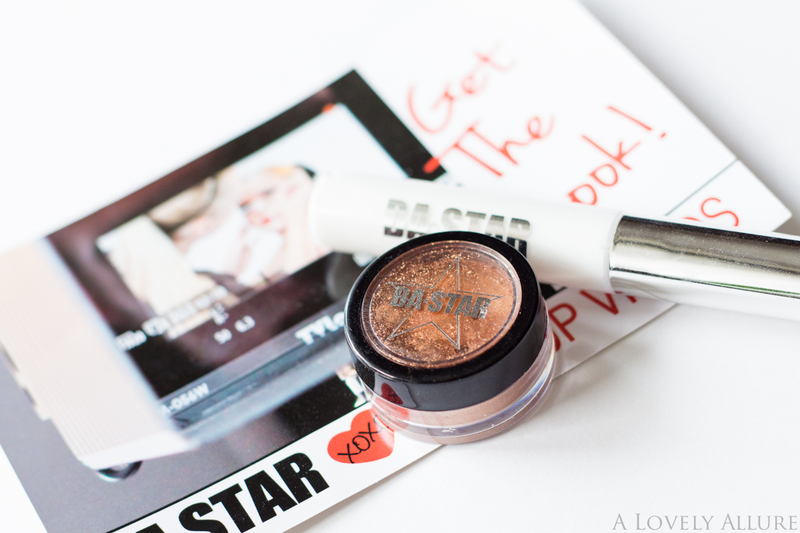 I was recently given the opportunity to try out 2 products from BA Star Makeup. 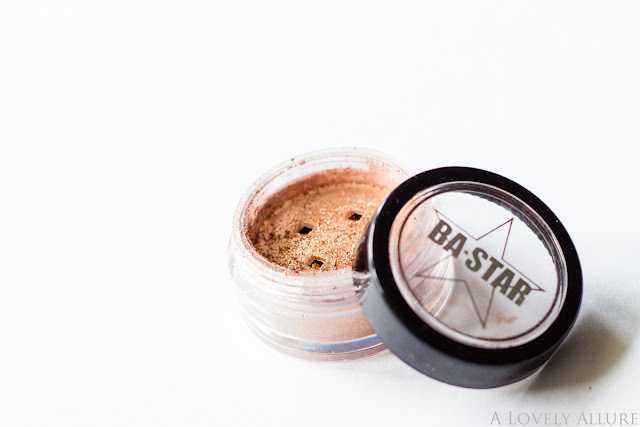 Although I have only heard of this brand before through a few bloggers, BA Star is said to be very popular with cheerleaders, dancers, and performers. Their product focus is on high-pigmented makeup and lots of glitter! The Mineral Eyeshadow Stardust I received was in Bronze. 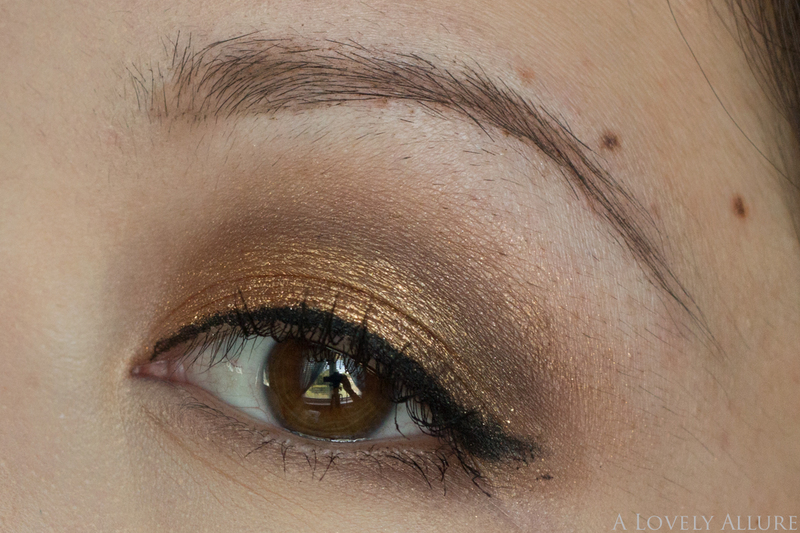 I was surprised at how pigmented this eyeshadow was. My first impressions were that it is very sparkly and glittery! It seems to be a golden bronze, and It definitely pops on the eyelid, and reflects off of light so easily. I can see why it would be great to wear while performing. It is definitely a different kind of bronze than Maybelline's 'Bad to the Bronze' Color Tattoo. It is much lighter, golden, vibrant, and way more sparklier (whoa). I had to apply this before foundation because I knew the glitter would get all over my face (I was prepared this time). 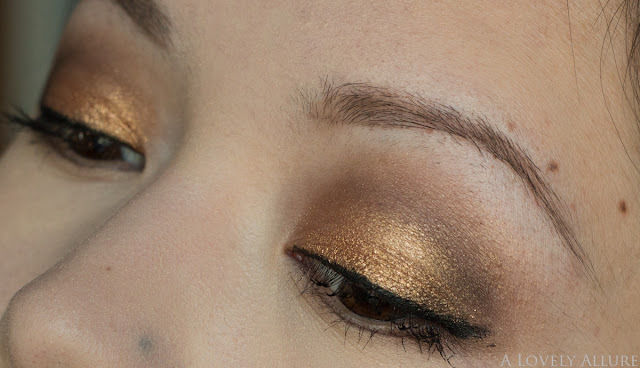 I just pat it on my lid, and then blended a darker brown into my crease. I love how sparkly it is and it lasted throughout the majority of the day. The glitter glue is nothing too special, but it does do a decent job of holding the colour for the majority of the day. 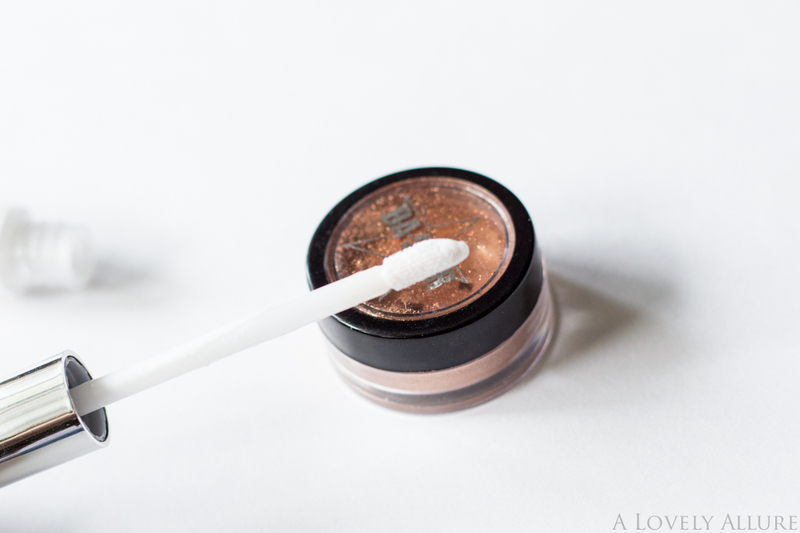 You definitely do need to wear the glitter glue or some sort of primer with the mineral eyeshadow, or the colour won't show up strong enough and definitely won't last. Without primer/glitter glue it will just wipe away and leave you with sparkles everywhere! It lasted about 6-7 hours before creasing with the glitter glue, although I wasn't too fond of the glue-like scent it had. 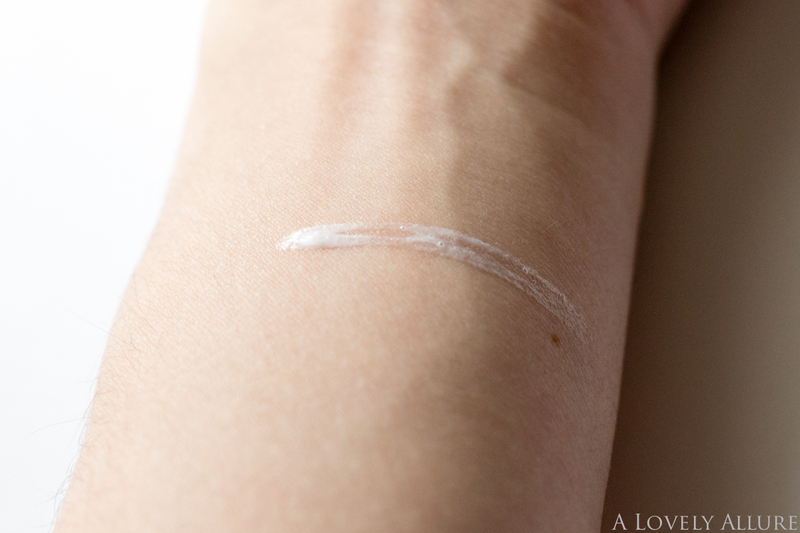 It felt cold and wet when applied, and just the fact that it looks like glue makes me uncomfortable to regularly use this on my eyelids. It claims to be sweat-resistant and non-sticky, and while it did hold up for the majority of the day, it rubbed right off with water. It was a little sticky on my lids, but was fine after I applied the eyeshadow. I actually found my Urban Decay Primer to hold the colour longer than the glitter glue did, and it stayed on when I rubbed it with water, unlike the glitter glue. But.. the glitter glue made the colour stand out a lot more. Because the bronze colour is so versatile, you could also use this as a body shimmer on your shoulders, or wherever you want a little bit of sparkle! As you can see below, the glitter glue worked the best with the mineral eyeshadow, but it rubbed right off with water. It barely rubbed off when I used the Urban Decay primer, but the colour is not quite as vibrant. If you weren't really fond of this colour, there are 8 other shades to choose from on their website, some of which are a deep purple, dark brown, or silver. They all sit at the same price of $8.75, and if you order 6 or more, they are only $5 each. However, shipping to Canada is with UPS and very pricey starting at $19.37. Shipping within the US is also a little pricey at $12.71. Hopefully, we will see a cheaper shipping option in the future. Ooh! But I also have a discount code for my readers! 50% off with the code: BBDUST. This might make up for the high shipping, but be sure to use it before expiry, September 30th! Disclaimer: I received this product for my honest review through BrandBacker. All opinions stated are my own and are not influenced by any affiliates.